Join me from 10 am to 4 pm at Fire Om Earth, 872 Mill Hollow Rd., Eureka Springs, Arkansas, for a one-day work: Backyard Medicinals: Into the Wild with Steven Foster. This is the only Arkansas event I have scheduled for 2014! For details go to Fire Om Earth’s workshop page. Early bird registration deadline extended until April 15th. $75.00. After April 15th, $95.00. Also checkout Melissa Clare’s Plant Spirit Communications event, and Lorna Trigg’s Creating a Medicine Wheel Garden at Fire Om Earth, April 27th. Make a weekend of it. The Ozarks have nearly 3,000 species of plants, which includes about 25% that are edible and medicinal, perhaps 500 species. It is helpful to understand that different plants occur in different habitats. We will look at which plants you might find in a specific habitat. Spring is our best season for wild edibles and medicinal plants, the time when we get dandelion greens, wild onions, pepper grass, plantain, pokeweed, and purslane, among others and a good time of year to enjoy edible flowers such as violets and elderflowers. Come prepared to learn, enjoy, and ask questions. Japanese honeysuckle, to some a weed, to me a medicinal plant. In segments of the conservation community the question has arisen as to whether the possibility exists that some plants considered weeds in the United States may have some kind of economic value in terms of medicinal or food use that could translate into a commercial harvest, and hence an opportunity to control the weeds. 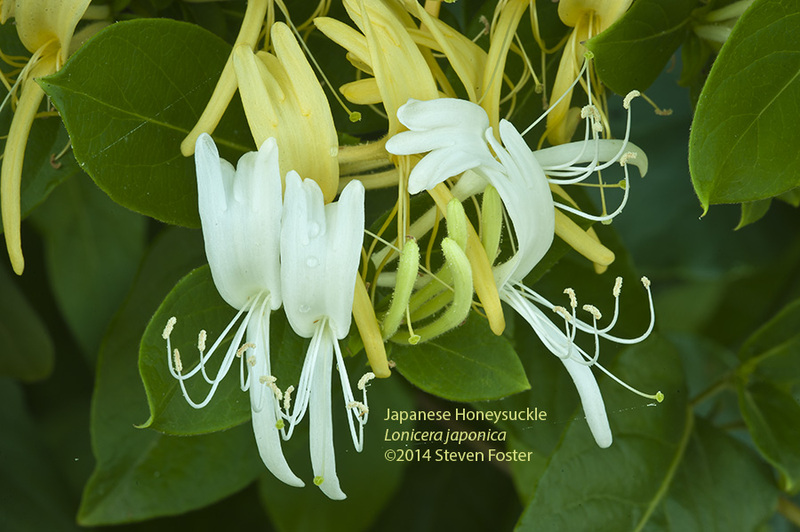 Japanese honeysuckle produces two major ingredients in Traditional Chinese Medicine (TCM). The flowers are known as jin yin hua which consists of the dried, unopened buds of Japanese honeysuckle. Another product is the dried stems with leaves attached known as ren dong teng. The Chinese name jin yin hua means gold and silver flower. This refers to the fact that the white flowers turn golden yellow one or two days after blooming. The Chinese name, referring to the stems with the leaves attached, ren dong, means “stand in winter” in reference to the fact that the leaves are evergreen. more info…….well come to the workshop!!! !